In 1909, when the University Hospitals first opened their doors in an old fraternity house, patients were offered care for free. In the Report of the Medical School to the President of 1912-1913, Dr. Richard Olding Beard expressed concern pertaining to the growth of both the inpatient and outpatient services. The hospital had a waiting list that ranged between 20 and 30, while the clinic was congested. Dr. Beard stated that it was not possible to treat all of the patients who presented at the clinic or hospital. In the 1913-1914 Report of the Medical School to the President, the Outpatient Department cited 13,575 new patients and 47,347 visits, averaging around 155 visits per day. This congestion led to a $0.10 per patient per ambulatory visit charge to be instated beginning July 1, 1915. There was also a prescription fee for patients requiring prescriptions. The inpatient wards were not far behind in leaving the “free for service” model, with approval from the Board of Regents coming in the 1918-1919 school year for 50 beds in Elliot Memorial Hospital to be used by patients who would pay a per diem charge. 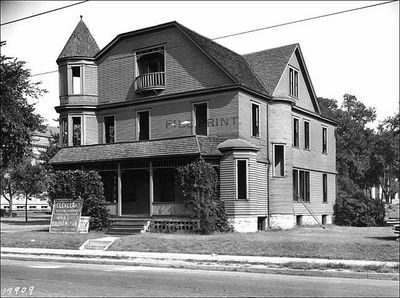 In 1921, the County-State plan for caring for indigent patients who were residents of Minnesota was passed into law, requiring that patients be referred by their family physicians and be certified for care by the Judge of Probate of the county of residence prior to visiting the clinic. In 1923, this was amended to designate the county commissioner as the official authorized to certify eligibility for care, which meant that the University Hospitals could now bill the county for half of the patient’s bill. The balance was billable to the state because of state appropriations. Whether the cost was free, $0.10 per patient per visit, or a small per diem, visiting the University Hospitals was a pretty good deal. Primary source of information was Masters of Medicine by J. Arthur Myers. 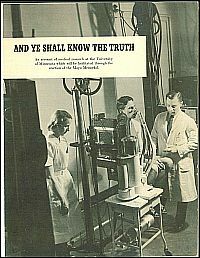 The brochure “And Ye Shall Know the Truth” was a post-war media campaign to emphasize the work done at the University of Minnesota Medical School. 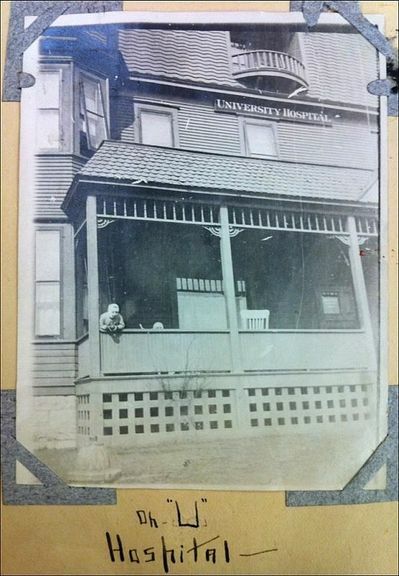 At the time the University was involved in a major development push to fund and build what would become the Mayo Memorial Building. The brochure highlights what was then current and past research at the Medical School and names its most notable faculty. Ironically, Ancel Keys and the Laboratory of Physiological Hygiene are featured on the cover; yet, the lab did not move into the completed Mayo complex and instead remained in space underneath Memorial Stadium. The Mayo Memorial opened in 1954. Thirty-two years later it was replaced as the primary hospital. Today it still provides some research and clinical space amid administrative offices. See the full brochure below. In 1946, an outbreak of polio spread across the United States and Minnesota was not isolated from this epidemic. At the University, the Minnesota Poliomyelitis Research Committee, a team of medical researchers from a variety of disciplines under the direction of Maurice Visscher, created sophisticated surveys and data sets based on this epidemic to better understand the disease. As part of this effort, the University Hospitals provided care to polio patients, both acute and chronic, as a public health service and a means to collect research data. Many of these patients were cared for off-site at the Fort Snelling army station hospital. Activities at the fort quickly came to a close in 1946 after the drawdown of troops after World War II. This drawdown, however, created a new opportunity for the University that proved to be a timely resource. 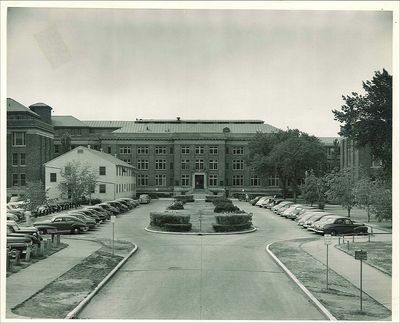 In December 1946 the University entered an agreement with the War Assets Department to “enter upon, occupy, and use” the facilities and grounds of the Gopher Ordnance Works, a war-time munitions plant and barracks, in Rosemount, MN for the cost of $1. On January 3, 1947 the University moved non-acute polio patients to the new location and opened the Rosemount Hospital. 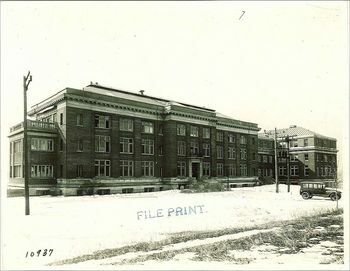 The Rosemount location served as a hospital until June 30, 1948. During that time, it saw 269 patients for a total of 33,014 patient days. 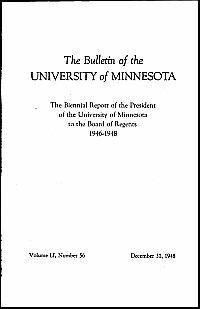 Much of the above information and more on the University’s response to the 1946 polio epidemic can be found in the “Biennial Report of the President of the University of Minnesota to the Board of Regents 1946-1948.” Read the full report below. November 8th marked the 115th anniversary of the German physicist Wilhelm Röntgen’s detection of x-rays while conducting an experiment in his laboratory. The medical application of Röntgen’s x-rays as a diagnostic tool was immediately apparent. Within a few months of the publication of his findings, a physics professor and football coach at the University of Minnesota, Frederick “Fred” Jones, acquired the equipment to duplicate Röntgen’s results. By March of 1896, Prof. Jones began providing campus lectures on the properties of x-rays and demonstrating the ability to determine densities of liquids and minerals, to see a pair of glasses within a leather purse, and to show the skeleton structure of frogs and fishes with use of the newly discovered rays. That April, Jones lectured medical students on the the use of x-rays to take pictures of tuberculosis patients. In October 1896, Dean Millard of the Department of Medicine requested Prof. Jones assist in locating bullets in two patients at the City Hospital of St. Paul. Both were located successfully allowing for more precise surgical operations. A decade later, the construction of the Elliot Memorial Hospital on campus highlighted the need for an on-site x-ray service. In 1912 Dr. Frank Bissell became the first radiographer for the University Hospitals. In 1923 the hospitals established a Division of Roentgenology with a focus of diagnostic and x-ray therapy. 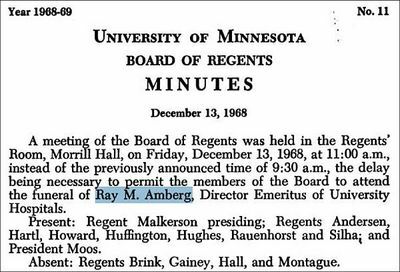 To learn more about the history of radiology at the University of Minnesota, see the 1967 “A Brief History of the Department of Radiology” by Drs. 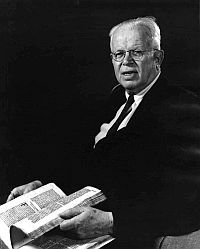 Stephen Kieffer, Eugene Gedgaudas, and Harold Peterson. Every war requires that doctors and nurses become soldiers. 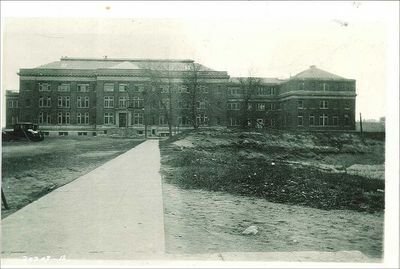 The University of Minnesota Medical School first became involved with such an effort as World War I spread across Europe. In October 1916, half a year before the United States declared war with Germany, the University of Minnesota and the Mayo Clinic began preparations for establishing a base hospital at the request of the Surgeon General. The unit, known as Base Hospital No. 26, organized itself over the summer of 1917 under the auspices of the American Expeditionary Forces and waited for the call to active duty. 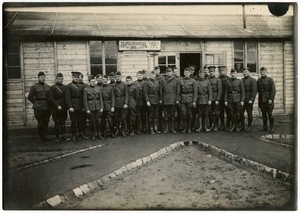 In December 1917, the War Department mobilized the unit. It was not until June 20, 1918 that the unit reached its destination of Allerey, France. In sum, the unit’s equipment and staff were designed to support a 1,000 bed hospital. It cared for nearly 6,000 patients through 1919. Historical information about Base Hospital 26 is available from a variety of sources. 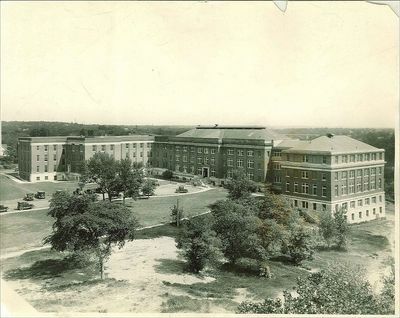 The Minnesota Alumni Weekly chronicled the activities of the Base Hospital through regular articles and published letters from the unit’s staff. Also, several archival collections have material related to the unit including the papers of Dr. Moses Barron, a University of Minnesota pathologist who served as an officer in the unit. 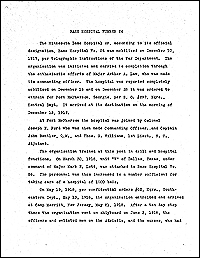 Included are photographs, correspondence, diaries, and related information all pertaining to Base Hospital No. 26. See a short typewritten history below of Base Hospital No. 26 as an example of the materials available in the Barron papers at the University Archives. Erected at a cost of $155,000 dollars, the Elliot family provided approximately $115,000 to honor Dr. Adolphus Elliot, a former Minnesota physician who passed away in 1902. The legislature provided the remaining $40,000 plus another $44,000 for equipment. 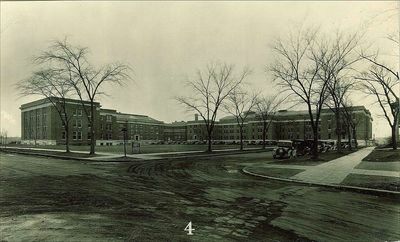 The site of the new hospital anchored the proposed new campus south of Washington Ave. Elliot Hospital spanned the southern edge of the new campus along the Mississippi River and the new anatomy building (now Jackson Hall) marked the northwestern corner. University President George Vincent ceremoniously laid the anatomy building’s cornerstone on the way to the hospital dedication. In tandem with the gift from the Elliot family, 38 prominent individuals of Minneapolis provided the $42,000 to purchase the land for the new hospital as a gift to the University. Many of the family names are familiar today including Pillsbury, Dunwoody, Shevlin, McKnight, Gillette, Donaldson, and many others. The 115 bed Elliot Memorial Hospital served two key functions. First, it was a modern clinical teaching facility for medical students integrated into the campus environment. Second, it provided free health care services for charitable cases from across the state. Initially all hospital services were offered free of charge. Elliot Memorial Hospital is now the Elliot Wing of the Mayo Memorial Building. 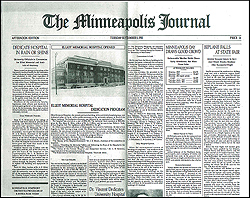 Read more about the dedication and construction of the hospital from the Minneapolis Journal. 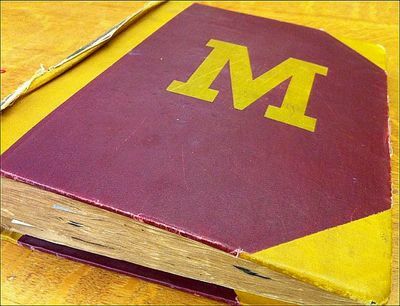 Articles from below the fold or on subsequent pages are available at the University Archives. Also note the articles related to the State Fair. In 1971, President Nixon famously began the “war on cancer” by signing the National Cancer Act. The Act, however, was not the beginning of the NIH’s attempt to promote cancer research and treatment but instead was a reinforcement of the goals of the National Cancer Institute founded in 1937. 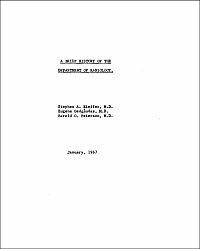 The 1971 Act expanded the budgetary and programmatic functions controlled from within the National Cancer Program and gave the director a direct line to the Office of the President outside of the NIH. 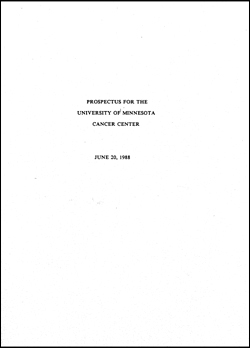 By the time of the 1971 National Cancer Act the University of Minnesota had spent 50 years of establishing cancer treatment and research through charitable giving. Cancer treatment and care as a focus formally began in 1923 when the Citizens Aid Society led by Mrs. Carolyn McKnight Christian donated $250,000 to the University to open a 50-bed hospital for the treatment of cancer in honor of her husband, Mr. George Chase Christian. The gift also included money for the purchase of equipment and cobalt for radiation therapy. The Christian Wing was appended onto Elliot Memorial Hospital and is still structurally a part of the Mayo Memorial complex. In the 1950s the Minnesota Masons followed suit with a campaign to establish an 80-bed facility with research space. Shortly after is successful completion in 1958 the Masons went on to raise the funds to add two additional floors to the facility and 50 more beds. The Masonic gifts to the University also included the establishment of an endowed Masonic Professorship in Cancer. In 1958 the Veterans of Foreign Wars donated $300,000 for cancer research space at the University. The research facilities were built adjacent to the Masonic Memorial Cancer Hospital. By the mid 1980s, the Medical School and those involved in cancer research in other disciplines began a push to establish a formal cancer center on campus. The University of Minnesota’s Cancer Center opened in 1991. Read the 1988 prospectus for the Cancer Center below and note the emphasis on interdisciplinary programming.